Well, it finally happened, The skies cleared, the grass dried, and I mowed the yard. This is a momentous occasion. It is the beginning of the neighborhood yard wars. It has always been a friendly war with most of the effort focused on not getting too far behind the group. The group is a small one. In one of my earlier posts, I mentioned that Ron has moved away to Oklahoma while making certain that his new neighborhood has no one who mows their own lawn. Randy has been sidelined by knee problems. That left the Doctor down the street and I to do battle. It was a friendly yard war and neither of us took it too seriously. The Doc has a Honda mower and I use a Toro. I was looking forward to this year because I travel a lot less now and of course that might just give me enough flexibility to mow when the yard needs it instead when I got home from Northern, Va. Unfortunately the Doc deflated my balloon over the weekend. He has decided to go with a lawn service this year. He may even have a good excuse, but it doesn't matter, I'll be the last of the over the hill gang still mowing. Mowing your own yard is an honorable tradition, so I guess I'll have to carry it for the group. I enjoy the smell of fresh cut grass, I like the patterns that mowing creates, and I think most of all it is actually something tangible that I can see that I have accomplished. I did not always enjoy mowing. My mother used to joke that my friend Mike would often rescue me and help finish our yard when I was a kid. She even claimed that I once said that I wanted to live in a house surrounded by green painted concrete. When Glenda and I first got married, in theory I agreed to mow the yard as long as I could mow it with a John Deere tractor with a seven foot cutter bar. I think that worked for a month or two, then Glenda and my mother sneaked off to Bridgetown, NS and came back with our first Toro. Our place in St. Croix Cover soon had a manicured lawn. It was as manicured as a former sheep pasture could get. When we moved to Tay Creek, NB, we got a Cub Cadet riding mower since our yard was bigger and we had less time to devote to it. Mowing in Tay Creek was like negotiating an obstacle course of rocks which continually inched out of the rock filled NB soil. When we moved to Halifax, the Toro went with us and handled our postage stamp sized yard easily. The top soil in Halifax was only about four inches deep, but it grew absolutely outstanding grass. When we moved to Columbia, Md. the humidity and heat were too much for me so the Toro was parked, and for two summers we were there, we had a lawn service. We had fescue grass in Maryland and it just never felt as good on bare feet as our Canadian grasses, but it was really the heat and humidity that kept me from mowing. Then we moved to Roanoke and the Toro came back to life. I also managed to over seed the yard with blue grass which gave me that wonderful on the bare feet soft grass carpet. A few years after we came to Roanoke, it came time to retire the Toro and get a new one. It still gets used once in a while. The new Toro is self-propelled. Glenda finds it impossible to control the new mower so for those rare times I'm away, the old mower has been pressed into service. Of course getting attached to your mower is not just my affliction. My brother-in-law, David, has a John Deere riding mower which I think is now twenty years old. He seems to be one of the few John Deere champions in a neighborhood of Cub Cadets just outside of Mount Airy, NC. I guess all us North Carolinians make a few choices when we are born, first you pick your basketball team, Duke, UNC, NC State, or Wake Forest. Then you decide whether you like Fords or Chevys, eastern or western barebcue and finally you pick John Deere or Cub Cadet for your riding mower. Then they can fill out your birth certificate and give you a name. 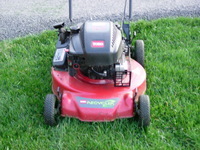 Well I may not have a John Deere riding mower, but I do have one very faithful Toro. The yard wars are likely going to be pretty quiet this year. Those of you addicted to yard work can check out the other yard pictures that I posted to my Flickr account in the set, First Mowing.